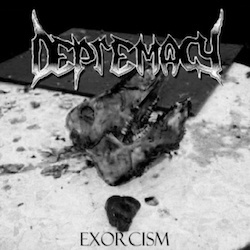 Depremacy is a local band (well, local for my parts anyway) that plays a caustic hybrid of old school thrash with some densely black elements. After seeing this band grow from talking with them and our various run-ins at the local CD shop (which usually had me listening to rough demos on one of the members’ phones) it’s really cool to see their hard work pay off with a very good piece of work. Exorcism is a throwback to the days of old, but what gets me about these guys is that the metal youth has really been given a kick in the back that it needs. The music is roughly polished with harsh vocals not quite black metal, but certainly with a death-breathy feel to them. With some serious Slayer-meets-Sadus-meets-early-Death vibes going on through the music, it’s not exactly perfection in its originality, but what can be said is that this type of old-school blackened thrash is at least entertaining and fluid. The riffs here are really hammering, especially the Slayer-esque “The Final Betrayal” that reminds me of the Haunting the Chapel EP some, oh, 27-years ago. The ever-changing tempo and chord barrages lend credence and vitality to an otherwise stagnating genre of late. If I hear one more Toxic Holocaust clone I’ll surely climb atop the nearest clock tower, rifle in hand. For the engaging value alone, Exorcism seems to be a good jump start. It’s raw and unpolished in some areas of production (especially in Trenches of Annihilation”, which seems to level in and out to my ears), but for an initial foray it’ll be interesting to see if the spark fuels more reckless abandon.